It is our pleasure to serve homeowners, General Contractors, business owners, associations, and others. 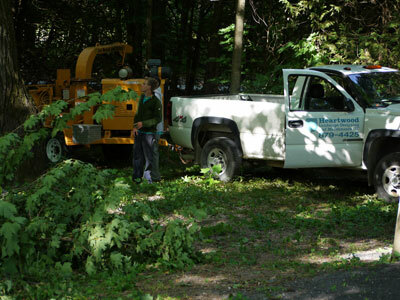 For over 30 years, Heartwood Landscape and Tree Services LLC has provided quality landscape improvements and installations and dependable winter services such as snow plowing and salting. In addition we are pleased to offer a range of tree care services such as tree pruning, removals, cabling and assessment. Joye Curtiss founded Heartwood Landscape and Tree Services LLC after receiving her degree in Environmental Design from State University NY. Please contact her at heartwd@myfairpoint.net for landscape related estimating or design. Mark Curtiss has worked in landscaping industry since 1979 and oversees the majority of Heartwood’s landscape projects. You can email him at markheartwd@myfairpoint.net. Maxwell Curtiss is a graduate of Paul Smiths College and is a Vermont Certified Arborist. Please contact him for any tree services (tree pruning, removals, assessments) questions or estimates at maxheartwd@myfairpoint.net. Heartwood attends various training seminars and industry shows during the year, and is a member of Green Works and the Vermont Nursery and Landscape Association, and the International Society of Arboriculture.